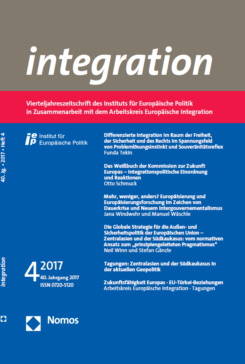 In the new issue of integration, Funda Tekin explains the basic principles and concepts of differentiated integration in the Area of Freedom, Security and Justice and focuses on the member states’ dilemma between their problem solving instinct and their sovereignty reflex. Otto Schmuck analyses the White Paper of the Commission on the Future of Europe and the corresponding reactions of the heads of state or government of the member states, EU institutions, academia and EU citizens. Jana Windwehr and Manuel Wäschle discuss the consequences that the European Union’s ongoing and multidimensional crisis and the associated changes of the European “rules of the game” – summed up under the controversial heading New Intergovernmentalism – could mean for Europeanisation processes and research. Neil Winn and Stefan Gänzle discern the impact of the new 2016 Global Strategy for the European Union’s Foreign and Security Policy on the EU’s evolving strategy towards Central Asia and the South Caucasus by focusing on the changing geopolitical context as well as domestic factors in the target countries and the EU itself. The issue contains also a summary of the second international conference of the PhD Support Programme ‘The EU, Central Asia and the Caucasus in the International System’ and the ‘Arbeitskreis Europäische Integration’ reports on conferences about current economic policy challenges for Europe and EU-Turkey relations. The Area of Freedom, Security and Justice is characterised by a slow process of communitarisation, a fast expanding acquis communautaire and a high degree of flexibility and differentiation. This article aims at explaining the basic principles and concepts of differentiated integration in this policy area. In doing so the variances of differentiation shall be highlighted. Furthermore, the article discusses differentiated integration as tool for necessary reforms in the Area of Freedom, Security and Justice. The analysis is guided by the general assumption that EU member states face a dilemma between problem solving instinct according to which they seek common solutions to transnational problems at the supranational level and sovereignty reflex that motivates them to preserve their sovereignty rights. On 1 March 2017, President Jean-Claude Juncker presented the “White Paper on the Future of Europe” with five scenarios for the development until 2025. The aim of the Commission was to stimulate and structure a broad public debate. In addition, the Commission published five reflection papers to illustrate the impact of the scenarios on key policy areas. Heads of state or government of the member states, EU institutions, associations and EU citizens participated in the discussion on the white paper. A special interest in scenario 3 “Those who want more do more” can be identified – also with regard to a possible further development of the cooperation between the Euro countries. In his 2017 State of the Union Speech, Juncker himself supported a mix of scenarios and placed great importance on preventing a split between euro countries and non-euro countries. Europeanisation is an established concept of European integration theory including a stable framework and numerous empirical areas of application today. Therefore, it is all the more surprising that – with few exceptions – there is little debate about the consequences that the European Union’s ongoing and multidimensional crisis and the associated changes of European “rules of the game” implicate for Europeanisation processes and research. Important changes are discussed under the controversial heading New Intergovernmentalism whose potential consequences for Europeanisation are discussed in this article. It is argued that under conditions of an increasing orientation towards national interests, domestic resistances as well as a growing informality of European decision-making Europeanisation processes become more complex. Nevertheless, some ambiguity remains concerning a stronger or weaker European influence on national policies. In addition, the upload and interload dimensions (the latter understood as selective co-operation among single member states) predictably gain in importance. The article discerns the impact of the new 2016 Global Strategy for the European Union’s Foreign and Security Policy (EUGS) on the EU’s evolving strategy towards Central Asia and the South Caucasus, two key regions proximate to the EU. The EU now advocates “principled pragmatism” in its external relations. How far will EU policy move away from an emphasis on norms and values and turn towards more pragmatic material interests? Furthermore, the article will assess the process of implementing the EUGS in Central Asia and the South Caucasus by focusing on the changing geopolitical context as well as domestic factors in the target countries and the EU itself.